If you've been following the local media in the U.P., my Instagram, or stay in touch with me in general, you may understand why my blog posts have been so, well, non-existent lately. 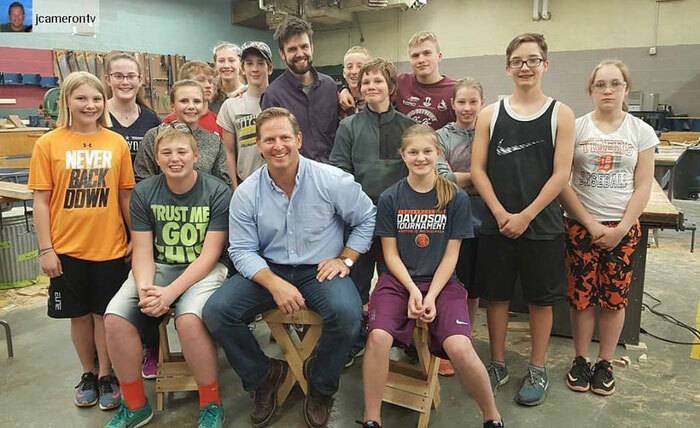 This past Friday, the Hawkshop was happy to host DIY network star, Jason Cameron. Jason Cameron is a former graduate of Republic-Michigamme Schools and hosts the television shows "Desperate Landscapes," "Sledgehammer," and "Man Caves." Jason came in to promote awareness of and to help bring back trades education, and also give a commencement speech at our graduation ceremony. Needless to say, this created a lot of hype, and preparation increased my workload enough to where (my apologies, again) I had to sacrifice a few things from my to-do list. Jason Cameron is the reason we were able to acquire a very generous donation from Bosch tools. Bosch tools appreciated the efforts taking place in the HawkShop to bring back a vital part of education that is missing in many areas. Because Jason was able to reach out to Bosch, Bosch was able to reach out to us, and we received brand new Bosch power tools with gratitude and a commitment to continue what we are doing. The day started with multiple interviews between Jason and me about the need to bring back trades education, and the struggles that are faced in doing so. We talked about our current work force and how we can help address the skills gap. Much discussion was had on the impact Bosch tools had, as well as Jason Cameron's unwavering support. Footage of these interviews should be released shortly. The day ended with a project that incorporated all of the tools Bosch donated: a fold up patio table or handy campfire stool. The main priority, highlighting the positive effect Bosch tools has had on the Hawkshop, and on trades education, was displayed. Footage of this will be released as well. Jason Cameron concluded his visit with a commencement speech at graduation where he talked about work ethic, integrity, wisdom, winning, and failing. It was a very exciting week for the HawkShop, and HawkShop students, with media coverage to boot!